Call A to Z Entertainment, Inc. today for free information about how to hire or book gospel music singers Trin-I-Tee 5:7. We are your agent and talent agency for booking and hiring Christian and gospel musicians, Angel and Chanelle, Trin-i-tee 5:7! We book or help you hire any live professional entertainers you want, in addition to those you see on our site. We also help you plan and produce you show or event, so call us today at 888-655-4575 and we’ll be glad to help you. GRAMMY® Award nominated, Gospel Music Association’s Dove Award and Stellar Award winner Trin-i-tee 5:7 has been the Best Selling Female Gospel Trio in music history. After more than a decade on the music scene, the New Orleans natives and original group members, Chanelle Haynes and Angel Taylor have transitioned Trin-i-tee 5:7 from a trio to a duo. 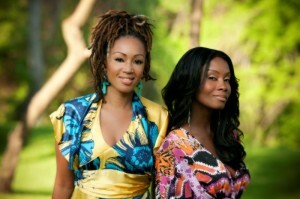 Trin-i-tee 5:7 debuted their new sound in a new project titled Angel and Chanelle, released in 2011 on Mathew Knowles’ Music World Gospel. The Angel and Chanelle CD marks their seventh recording to date. We can help you book or hire any Gospel or Christian music singers. We’re your best agency and agent for hiring and booking gospel music singers Trin-I-Tee 5:7, Angel and Chanelle. So call 888-655-4575 today and we’ll be happy to help you. A to Z Entertainment, Inc. is not the exclusive agency for any live entertainers on this site.